Westbank has built a practice around long-term commitments to artistry, sustainability and city-building. These commitments underlie an orientation towards projects like Woodwards, Vancouver House, Mirvish Village, Telus Garden and Oakridge – catalysts for larger change that go beyond the borders of the projects themselves. We are here to create. To provoke. To ignite. We are the vehicle for a new movement of cultural expression. As the practice matures, we have become more ambitious. With every new project reflecting our commitment to the philosophy behind Gesamkunstwerk, or in our recent work the Japanese philosophy behind layering, the net effect is that our work becomes much more complex and far-reaching. The core of Westbank’s mission is to create a body of work with a high degree of artistry that helps foster more equitable and beautiful cities. Westbank is active across Canada and in the United States, with projects including luxury residential, Five Star hotels, retail, office, rental, district energy systems, affordable housing initiatives and public art. Established in 1992, we are one of North America’s leading developers, with offices in Vancouver, Calgary, Toronto, Seattle, Shanghai, Beijing, Taiwan, Tokyo, Hong Kong, Shenzhen and over 25 billion dollars of projects completed or under development. Sign up to the Gesamtkunstwerk eMail Newsletter to receive a selection of consistently intelligent coverage of art, architecture and design culture. The Beach and Howe area was once a place brimming with activity around lumber, from log sorting to storage. Robertson & Hackett Sawmill Company operated just south of where the Gesamtkunstwerk exhibition space now stands, and the Canadian Pacific Railway (CPR) also ran south of Beach Avenue, alongside the mill for easy access to transport. 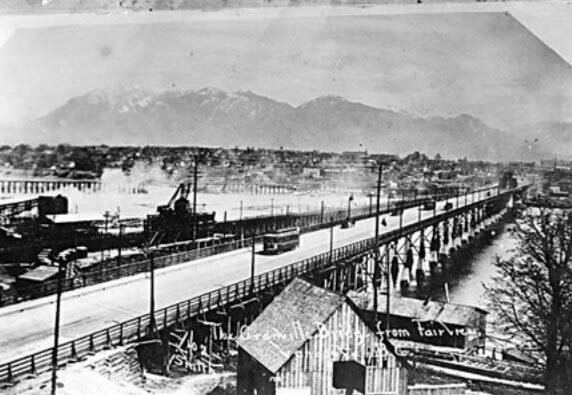 In 1889, the original Granville Street Bridge was completed, connecting downtown Vancouver to the mainland. The bridge, designed by the CPR, was a trussed timber swing span, tied with wire ropes to a central wooden tower that allowed boats and barges to pass by. In 1891, the bridge was widened on both sides for streetcar tracks. A second bridge was completed in 1909, which was a longer steel bridge with through truss swing span. The second bridge was designed primarily to accommodate primitive automobiles and streetcars. 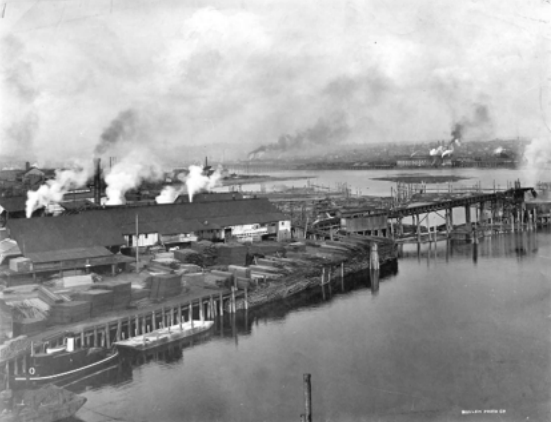 Most of the new residential and commercial development in the early to mid 1900s occurred in the West End and Central Business District, respectively, and the area under the bridge remained largely undeveloped, presumably because it was adjacent to the heavy industry along False Creek and was sandwiched between two Granville Bridges. With the popularity of the automobile, this area under the Granville Bridge was coined as “auto row”, and the Beach and Howe area became home to auto sales and repair shops. The construction of Vancouver House is one of the most exciting things to happen the city in decades. A new neighbourhood for both Vancouverites and visitors, the development brings along with it life: innovative public art (like this stunning Rodney Graham spinning chandelier), new retailers and — most importantly, re-imagined urban space for everyone. It’s history in the re-making.